Your product will be replaced should a fault develop during the 3 year term. Copes well with our school office shredding needs. 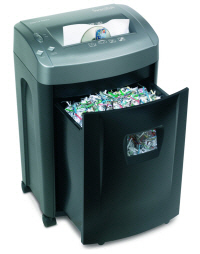 Tends to be small /medium amounts of shredding on a regular basis and then a 'blitz' which would result in our previous shredder overheating. Nice, large easy to remove container. No problems since we purchased it in early October. This is an excellent quite and efficient shredder. Its power in number of sheets it sheds simultaneously saves me time. It is in almost daily use with approximately a bin full per week. I am delighted with it and to date I cannot fault this item. Excellant value, the Swordfish 1500XCD performs it functions exactly as expected. Complemented by the very easy and efficient service provided by Tradescanners.com using the online payment facility. Very happy with this shredder. Perfect for our needs. Bought this shredder because it had a good review on another site. After buying it and using it for 6 months i think it is the best value item i have bought in a long time and would definatley reccommend for anyone with a small office. I would suggest that you buy the oil bags for it to keep it oiled which you put through the shredder once a month. Equipped with intelligent features such as a ‘full bin’ alarm and auto-reverse function, the 1500XCD guarantees high performance. With a high sheet capacity, it is ideal for a busy home-office.